The UN agency is working with the country's Ministry of Health and international nongovernmental organization Médecins Sans Frontières to conduct ring vaccinations across the affected region, where contacts of those infected, followed by contacts of those contacts, would all be vaccinated.Though 4,000 doses have been shipped, more are expected to be sent out, WHO spokesman Tarik Jasarevik confirmed.The latest outbreak is occurring in the northwest of country, in the Bikoro health zone, 400 kilometers (about 250 miles) from Mbandaka, the capital of Equateur province.Of the 39 cases of Ebola reported since April 5, two have been confirmed using laboratory tests. A further 362 people at risk have been identified using contact tracing, said Dr. Ibrahima-Soce Fall, WHO regional emergency director for Africa. "This outbreak is very close to the Republic of Congo and Central African Republic. 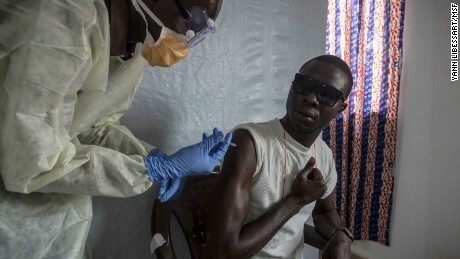 And we are taking it very seriously because it is close to Mbandaka, a city of 1 million people," Fall said, adding that there are two suspected cases in Mbandaka, and the patients are being held in isolation.The Ebola vaccine being provided — called rVSV-ZEBOV — is an experimental vaccine that has been shown to be safe in humans and highly effective against the Ebola virus, according to the WHO. A 2016 study found it to be 100% effective in trials in Guinea in coordination with the country's Ministry of Health after the 2014-15 outbreak.In Congo, vaccines will also be administered to local and international health care workers and front-line workers in both affected areas as well as the regions expected to be at risk should the outbreak continue to spread.Any other persons with potential exposure to Ebola, such as laboratory workers, surveillance and contact teams, will also be vaccinated. Anyone receiving the vaccine will then be checked three, 14, 21, 42, 63 and 84 days later. "Because it is an experimental vaccine, there are several steps to observe," Jasarevik said. In addition to an importation license, the WHO needs formal agreement on the research protocols with the government and local ethical review board approval for reasons of liability, and legal and insurance issues associated with use of experimental products, he added.Last week, Peter Salama, deputy director-general of emergency preparedness and response at the WHO, pointed out that use of the vaccine comes with many challenges, as it needs to be stored long-term at temperatures between minus 60 and minus 80 degrees Celsius (minus 76 to minus 112 Fahrenheit). "This is not a simple logistical effort; it's not like doing a polio campaign with oral polio vaccines, where we get it immediately out to the field. This is a highly complex sophisticated operation in one of the most difficult terrains on Earth," Salama said. The disease is endemic to the Democratic Republic of Congo, and this is the nation's ninth outbreak since the discovery of the virus in the country in 1976. "We know what we need to do, but we must do it quickly," Fall said.Ebola virus disease, which most commonly affects people and nonhuman primatessuch as monkeys, gorillas and chimpanzees, is caused by one of five Ebola viruses. On average, about 50% of people who become ill with Ebola die.The virus is transmitted to people from wild animals and spreads in the human population through human-to-human transmission, either through direct contact with bodily fluids such as blood or secretions or contact with materials that are contaminated with these liquids.Personal protective equipment, body bags, boxes for transportation and interagency emergency health kits have been sent to the affected region.Médecins Sans Frontières has set up four five-bed mobile isolation units to increase the hospital bed capacity in Bikoro, which is currently 15 beds. Bikoro hospital has sealed off a ward to diagnose suspected Ebola patients and provide treatment, according to UNICEF.West Africa experienced the largest recorded outbreak of Ebola over a two-year period beginning in March 2014; a total of 28,616 confirmed, probable and suspected cases were reported in Guinea, Liberia and Sierra Leone, with 11,310 deaths, according to the WHO. CNN's David McKenzie and Susan Scutti contributed to this report.